Hot on the heels of a wave of new apps released last week, HootSuite has brought together another great batch of tools into the App Directory for users to enjoy. Users on all plans will have access to these new apps, which include Nimble, StockTwits, and YUPIQ—all very useful plugins with a social business focus. The HootSuite App Directory has now grown to include 44 apps in just over a year. HootSuite users can add the various apps to their dashboard and use many of their favorites without ever leaving HootSuite. If you haven’t already, check them out and install some apps today! Once you start, you’ll get even more value out of the web’s favorite social media management system. Nimble, the First Social CRM App Directory Integration – Direct Install Link – Nimble is a social CRM (customer relationship management) tool that combines the power of unified communications, social media tools, client management and team collaboration—all with one plugin in the HootSuite dashboard. This first CRM integration in the App Directory extends the power of the HootSuite platform beyond marketers and social media practitioners. Now, salespeople and front-end customer service staff can tap into the burgeoning power of social media. View a complete conversation history. And even forecast sales. Cha-ching! The Nimble app is the first to make use of the new social profile drop down selector in HootSuite streams; simply hover over a social profile avatar in a stream and select View Nimble Profile. StockTwits – Direct Install Link – Investors and analysts, take note. StockTwits, a financial communications platform for the investing community, can now be found within HootSuite as well. StockTwits was founded in 2008 by long-time investor Howard Lindzon. They were the originators of the $TICKER tag, which enable and organize “streams” of information around stocks and markets across the web and social media. Today StockTwits provides streams of insights, ideas, links, charts and other important financial data for 1,000s of securities from over 200,000 members. This real-time pulse of the market is used by investors, analysts, media and others as they research stocks and manage their investments. The StockTwits app for HootSuite allows you to share ideas, links, and financial data to the StockTwits network directly from the dashboard. The StockTwits app is the first app to use the Compose Message Box feature, which allows for publishing to StockTwits via the HootSuite Compose Message Box and Social Profile Selector (see screen below). The Main Compose Box is where messages are composed and published for Twitter, Facebook, LinkedIn, and other natively supported networks. Ask any social media marketer and they’ll tell you that brand advocates and earned media are the holy grail of social media marketing. YUPIQ recognizes this value and created a social media promotions platform that increases sales and brand awareness by rewarding customers for sharing videos, links and special offers with their friends. Users who promote brands on Facebook, Twitter and email can receive rewards and offers for their efforts. 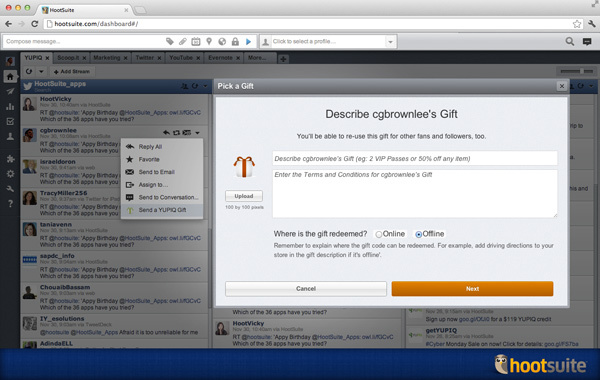 The YUPIQ plugin for HootSuite allows marketers to share gifts and offers to brand advocates right from the HootSuite dashboard. It also lets them refer the same gift to a limited number of friends. Start rewarding your community today! YUPIQ Direct Install Link. This new batch of apps undeniably deepens the “bottom-line” impact that businesses can have from within HootSuite; it adds a greater potential to create and measure a return on investment for time spent with social media. Getting serious about social business? Try some of the many apps available in the App Directory including these latest business-focused additions. 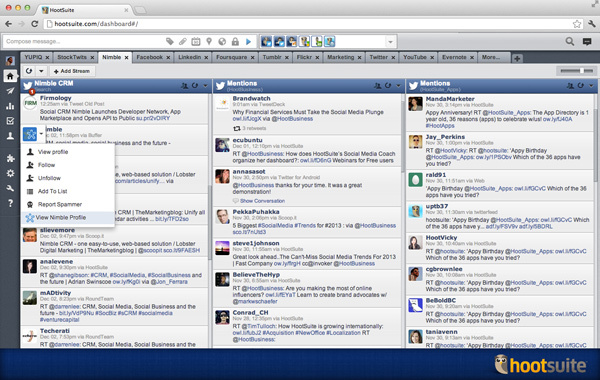 If you need help installing apps, check out HootSuite’s App Directory Guide. 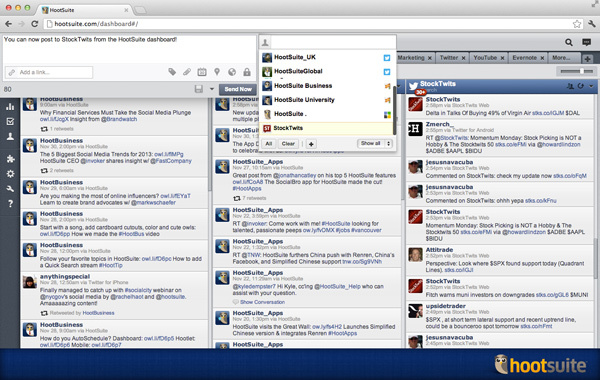 Also, be sure to follow @HootSuite_Apps for the latest updates and news on the HootSuite App Directory. If you’re an organization or developer who would like to work with HootSuite, learn how you can integrate your app using the App Directory SDK. This entry was posted on Tuesday, December 11th, 2012 at 7:02 am and is filed under National News, New Releases, Social Media, Software. You can follow any responses to this entry through the RSS 2.0 feed. You can leave a response, or trackback from your own site.